Material: The absorbent material is bamboo terry. When i unwrapped this gorgeous nappy i just had to put Amber in it straight away! It lasted 4 hours in the day without even a prewash. Would have definitely lasted longer if i had left her in it as it wasnt even wet outside. 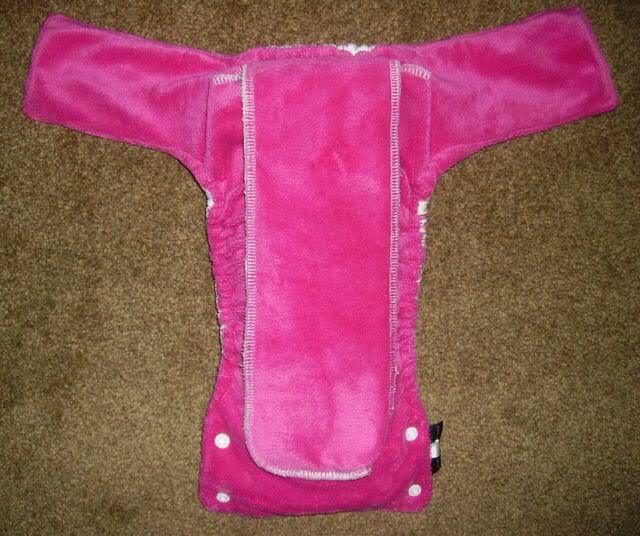 When i took it off her, her bum was bone dry, thanks to the minkee inner, so far i was happy with my purchase. So i popped it in the wash, eagerly waiting for it to be clean and dry and ready to use again. This time, i decided to try it over night, having had just 1 prewash. 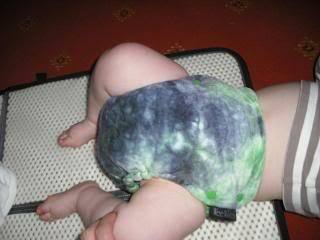 Just for safety i added a hemp booster to the bottom of the nappy. On it went again, with some wool shorties over the top and 12 hours later i checked it. The nappy was soaked but the wool was dry Fabulous considering the bamboo is no where near up to absorbency yet! Utterly thrilled with this nappy! Definitely will be buying more of these! The majority of these fabulous nappies are hand made especially for you so you do have the agonising wait time of approx 2-3 weeks. Luckily this was an instock item for me so i got my fix. I cannot fault Wee notions CS, it is FAB! And i cannot fault the nappy, it is very very well made and i just adore it. My daughter looked so comfy in it, its so so soft and squishy! You can get a bit carried away and it can get quite pricey but a basic bamboo terry outer is only £12.00!!! You HAVE to have one of these in your stash, they are a fab fit and work brilliantly and they are scrummy! 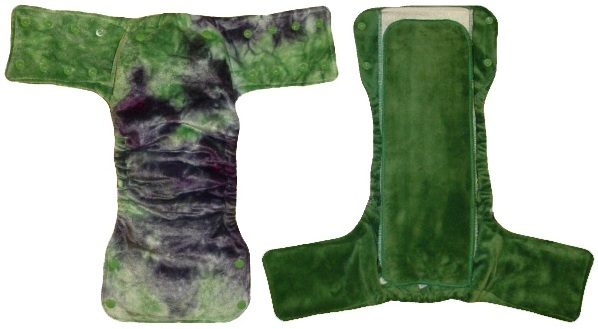 Material: The absorbent material is bamboo terry; if you choose a minkee inner then the top layer of the booster is minkee, back with a layer of microfibre. I was a little reluctant to order a new WNNN as the one I tried previously wasn't a good fit on Jasmine. However, I love the embroidery designs WN offer, and I love minkee and cuddlesoft inners, so I decided to give it a try. The customer service from Suzanne was fab, as usual, and two weeks later I was delighted to receive one of the prettiest, softest nappies ever! I chose a cuddlesoft inner and outer, and was delighted at how the top insert was poppered-in, topped with cuddlesoft, to ensure that no wet layers could touch Jasmine's skin. Although I'm not keen on microterry, I was happy to have just one, layer, behind the cuddlesoft, and there were still lots of layers of bamboo terry. The nappy is really well designed, with one insert sitting in the pocket, and the other poppering on top of the inner, to reduce leg gape. 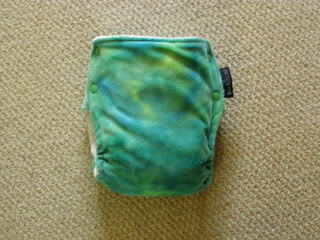 I was also able to fold over two layers to the front, to ensure extra absorbency in Jasmine's wet zone. The rise is very high, but I prefer to have a high rise on a night nappy, for extra absorbency. 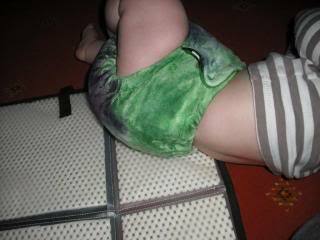 We bought a large, Jasmine is about 24lb, and the nappy fastened on the second tightest poppers on both sides. There was no wing gape. As I put Jasmine to bed, I was confident that she was in the softest, most comfortable night nappy imaginable. The next morning, the outer of the cuddlesoft was completely dry, as were the bottom layers of the bamboo terry, even though I had only given the nappy one prewash. I adore this nappy and will definitely be ordering more. It has spoiled me as I don't want to use most of our other night nappies any more! I just wish they did night pockets in the same design. I had heard LOT's of good thing about the WNNN for heavy wetters and thought I had better give it a try as Ds was leakng (again) at night. I asked (very cheekily) if it could be rushed through as I really needed something that would work for ds and recieved it a week after ordering. Absolutely fab cs from Suzanne as normal I got just a basic bamboo terry outer for £12 just to see how we got on with it. This is soooo soft and squishy and definately worth the money (as WN always are ). I got a fleece inner and the top insert was topped with the same fabric so no wetness would be touching ds's skin. It comes with a 6 layer snap in insert and a further 4 layer insert in the pocket. I doubt I will EVER need to boost this as there are so many layers. Perfect as I always need to boost lol. I gave is ONE pre-wash then put it on overnight for ds with no boosting. He woke up with dry skin and even though it was wet on the outside there were no leaks at all. Not bad for 14 hours and one pre-wash. I am very very impressed and know that if it works this well after one wash it is going to work brilliantly for ds when it is up to complete absorbancy. They are also quite slim compared to the nappies I was using so dp is very happy about that as he hated the HUGE bum he gets with the other ones. They are made to your specs so they do take 2-3 weeks to arrive so the wait can be a while if you can't find any instock. Ummmm can't think of any more negatives lol. If you have a heavy wetter I suggest you have to try one. I will have to get some more in my stash and I don't know how I have coped so long without them. So everyone raved about the new style WNNN, and even though the old style didnt suit my daughters shape well, i thought i'd try this one out. I bought a purple ooga outer M.
Well, I was disappointed to be honest. It didnt absorb anywhere near the amount i expected it to, going on other peoples reviews. It was too slim in the crotch to give adequate coverage, and the side snapping style didnt suit my daughters leg shape either. Also got a lot of leg gape (without additional boosting). The outside was sopping wet (under wool) in about 1 1/2 hrs, which i dont think is good at all for something which is supposed to be good enough for nights! 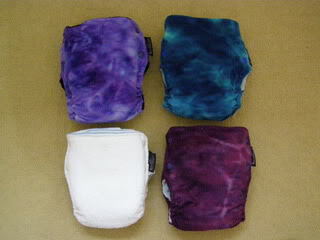 Yes, they are very pretty & cute & slim, and probably great for those babies whose shape they suit (and who arent heavy wetters! ), but for me, a no-no Im afraid. A shame. Overall coment: Absolutly Fab!! Brilliant! 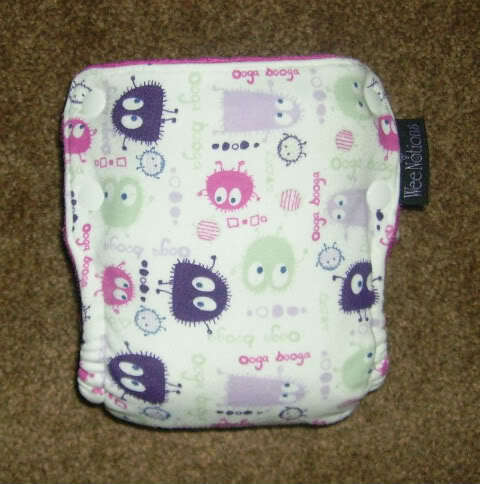 I tried it a couple more times and then decided to order a couple more...I ordered 4 more ( ) all with Minkee outter/cuddlesoft inner and these are just brilliant! After 13 hours or so the outter of the nappy is still dry, we have never ever ever had a leak from these, They are the only night nappy we use now and I hope hope hope that they keep working becuse we love them! I use them un boosted with only the inserts provided.